I made the Tortellini with Italian Sausage two more times now. I used only one pound of Italian sausage and another time used one pound of turkey Italian sausage (Aldi carries it). The taste is a little different, but still very good. After making my own apple chips, I found an 8 oz. package at Trader Joe’s. They contain no extra sugars, sulfur, etc. and were VERY tasty. With the amount we got in the package, it is probably cheaper to buy them there. Exercise: For upper body strength and cardio, I’ve been doing “Fit is Better than Skinny” on Fitness Blender. Upper body doesn’t burn enough calories or get a sweat going, so this is a good mix. In 30 minutes, “Fat Blasting Booty Builder” is a lower body strength and cardio HIIT routine. 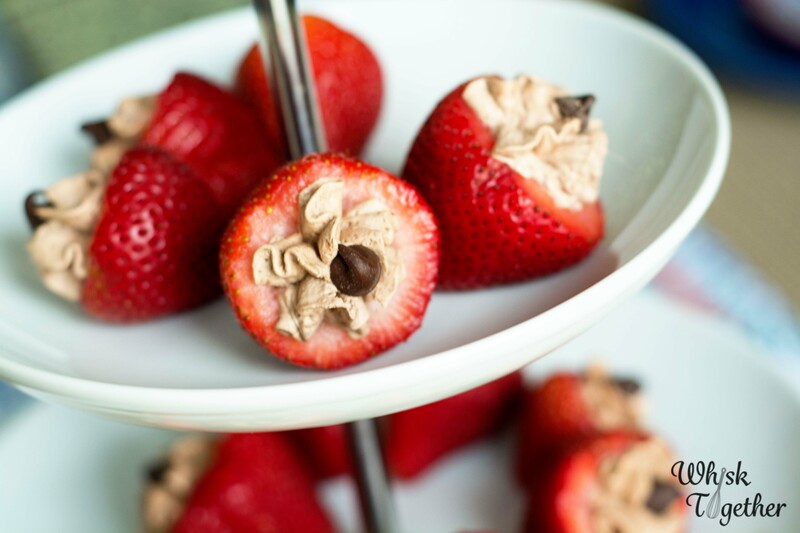 What’s better that cheesecake stuff strawberries? Chocolate stuff strawberries! 🙂 I love these little appetizers (or dessert!) because I can make them the morning of a party and still have time afterwards to relax. Just keep them chilled until serving. I would not let them sit longer than 6 hours in the fridge because of the fresh whipped cream. If time will be a problem, the alternative would to use a stabilized whipped cream with gelatin or use the Cool Whip alternative like TruWhip. Walmart, Kroger and our local Dierberg’s started carrying it. Trader Joe’s stopped carrying it – their price point was $1.99. Don’t have strawberries? 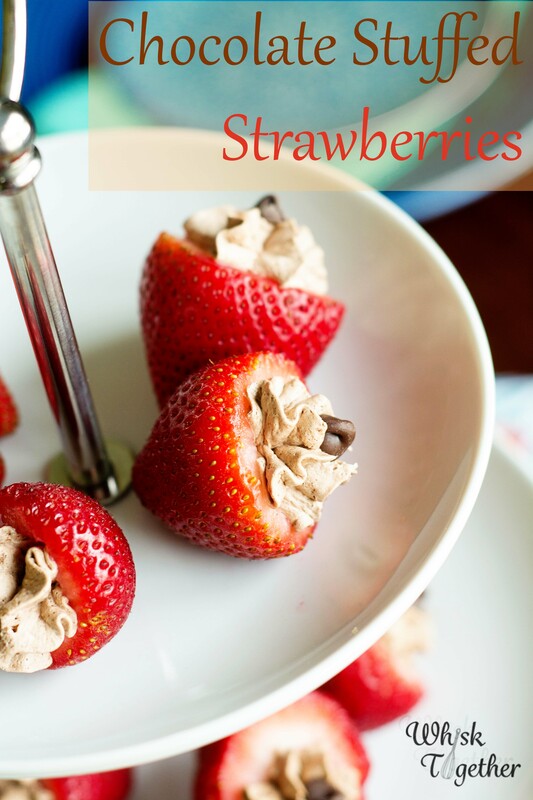 Use the chocolate whipped cream on cakes, cookies, as a filling or dip! Want the cream cheese flavor? Add in 4 to 8 ounces of cream cheese with the whipping cream. Lay out the strawberries on paper towels if they are still a little wet. This will draw away their moisture. Sift the powdered sugar and cocoa together into a large bowl or mixing bowl. Add whipping cream. Start on low to mix and then increase to high speed until the whipped cream forms soft peaks. Put into a icing bag or ziplock bag with the corner trimmed off. 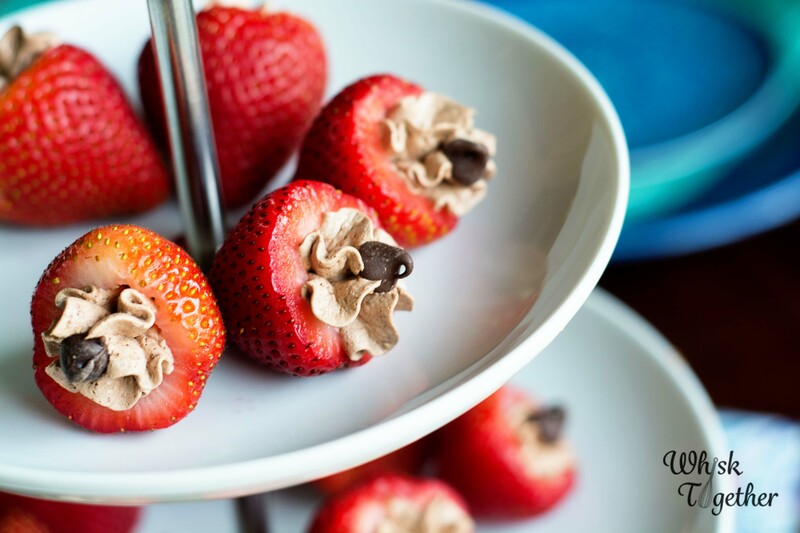 Pipe into the strawberries and top with a chocolate chip. Keep chilled. For the whipped cream, I used my 1M Wilton tip to pipe it. But a ziplock bag will work just as well.